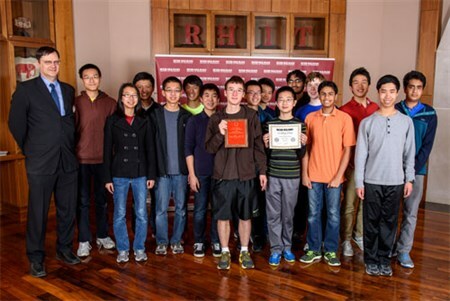 Problem solving: High School students from across Indiana and Illinois competed in the 50th annual Rose-Hulman Institute of Technology Mathematics Competition. Past winners have later become Mr. or Miss Indiana Math or Science and been named to the U.S. Team in the International Mathematics Olympiad. Carmel High School scored its seventh consecutive victory in the 50th annual Rose-Hulman Institute of Technology High School Mathematics Competition Nov. 14. Nearly 500 students from more than two dozen high schools put their math skills to the test in the annual challenge. Overall Team Scores: 1. Carmel 1,382; 2. Castle High School 992; 3. Urbana High School 833; 4. New Tech Institute 442. Senior Team Scores: 1. Urbana 338; 2. Carmel 336; 3. Fishers 311; 4. University High School of Indiana 310. Senior Individual Scores: 1. Christina Duffield, University 100; Simon Langowski, Carmel, 100; Daniel Vance, Fishers, 100; 2. Haoxiang (Howard) Li, Urbana, 95; 3. Paul Szewczyk, University, 94; 4. Tingyue Cui, Terre Haute South, 89; Miles Dai, Carmel, 89; 5. Henry Ando, Urbana, 88; Stephen Cornwell, Terre Haute North, 88; 6. Hanyu Zhang, Urbana, 85: 7. Melinda Liu William Henry Harrison, 84; 8. Chase Mahurin Terre Haute South, 83; Emily Tong Fishers 83; 9. Mitchel Cron, Castle, 82; Charlie Hergenrother, High School of St. Thomas More, 82; Audrey Pratt, Fishers, 82; 10. Ryan Jou, Carmel, 79; 11. Alden Mauer, William Henry Harrison, 77; 12. Kelsie Dale, Fishers, 76; Ruple Jairath, Castle, 76; Jonathan Ji, Terre Haute South, 76; Matthew Odle, Zionsville, 76. Junior Team Scores: 1. Carmel 378; 2. William Henry Harrison 352; 3. Marion High School 317; 4. Zionville 274. Junior Individual Scores: 1. Agustin Garcia William Henry Harrison, 100; Caleb He Carmel, 100; Anthony Ji Carmel, 100; Neil Thompson, Zionsville, 100; Brendan Yap Carmel, 100; 2. Chaman Kumar Terre Haute South, 95; 3. Truman Bennet, Marion, 94; Celina Qian, Carmel, 94, 4. Angela Sun, Carmel, 89; 5. Julie Lee, William Henry Harrison, 88; 6. Jayatri Balsubramanian Carmel, 84; 7. Carl Landskron, William Henry Harrison, 82; Clara Sellke, William Henry Harrison, 82; Evan Vesper, University, 82; 8. Nathan Fei, Carmel, 78; 9. Asim Dhungana, Carmel, 77; Jenny Zhao, Carmel, 77; 10. Sophie Fanok, Castle, 76; Micah Hoeksema, Marion, 76; Elizabeth Wuertley, Marion, 76; 11. Reka Manton, Urbana, 73; Evan Norris, Fishers, 73; Sunanda Prasad, Castle, 73; Vaishnavi Ravipati, Castle 73; 12. Anton Smodilla, Terre Haute North, 72. Sophomore Team Scores: 1. Park Tudor 400; 2. Terre Haute South 358; 3. Carmel 328; 4. Zionsville 312. Sophomore Individual Scores: Alex Gu, Park Tudor, 100; Michelle Shen, Park Tudor, 100; Andrew Wu, Park Tudor, 100; Allen Zhao, Park Tudor, 100; 2. Jay Maturi, University, 94; Justin Rowe, Terre Haute South, 94; Allen Zhang, Carmel, 94; 3. Isaac Meng, Fishers, 90; Patrick Mercho, Terre Haute South, 90; Jeremy Rusk, Terre Haute South, 90; Anthony Weng, Terre Haute South, 90; 4. Jeremy Chaing, Zionsville, 88; John Dalloul, Terre Haute South, 88; Eric Zhu, Carmel, 88; Joey Kurek, Zionsville, 84; Rachael Tan, Carmel, 84; 6. Jasper Baltz, University, 83; Anna Lubienski, Urbana, 83; Dylan Verst, Terre Haute South, 83; 7. Jon Hillery, William Henry Harrison, 80; Paaras Kumar, Terre Haute South, 80; Dana Yun, Champaign Central, 80; 8. Luke Uribe, Fishers, 78; 9. Rishi Das, Carmel, 76; 10. August Katz, Castle, 75; 11. Jessica Kempe, Castle, 70; Edward Lin, Zionsville, 70; Ian Samir, Carmel, 70; Kyle Wang, Zionsville, 70; 12. Meghana Bhaskara, Castle, 69. Freshman Team Scores: Carmel 340; 2. Terre Haute South 299; 3. Champaign Central 211; 4. Castle 178. Freshman Individual Scores: 1. Joey Heerens, Carmel, 100; Ethan Kirsch, Terre Haute South, 100; Kevin Liu, Carmel, 100; 2. Parker Jou, Carmel, 94; 3. Rithwik Palivela, Carmel, 88; Sophie Wang, Carmel, 88; 4. Tony Ou, Carmel, 84; 5. Satvik Kumar, Carmel, 83; 6. Amy Tian, Carmel, 82; 7. Camille Mendoza, Terre Haute South, 80; 8. Joseph Dalloul, Terre Haute South, 79; 9. Woojin Chung, Fishers, 76; 10. Emily Lothamer, Castle, 71; 11. Gary Zhang, Park Tudor, 70; 12. Eric Ma, Carmel, 65. The contest involved a one-hour test with 20 questions covering a wide range of mathematics categories. Past winners have gone on to be named Indiana's Mr./Miss Math or Mr./Miss Science, named to the USA Today All-USA High School Academic Team, and appointed as members of the U.S. team in the International Mathematics Olympiad. The event is hosted each year by the Rose-Hulman mathematics department. Questions are developed by emeriti mathematics faculty member Herb Bailey.